Coming out in cancer care: is disclosure of sexual orientation beneficial? Nurses and other health professionals are expected to ask patients about sexual orientation at every face-to-face contact across the NHS from 2019. However, there are concerns about the need for, and relevance of, sexual orientation disclosure, and the potential for discomfort and embarrassment. This article reports findings from qualitative interviews with 15 lesbian, gay and bisexual patients about how experiences of cancer care are mediated by disclosure. Three themes emerged: identifying the barriers to disclosure; approaches to, and facilitators of, coming out; and nurses’ responses to disclosure. 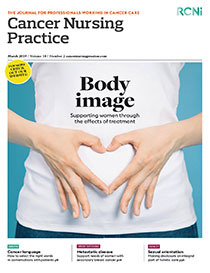 The findings suggest that disclosure should be situated in a model of holistic care in which patients’ individual needs are recognised as one of the eight principles of quality nursing. By treating the whole person, nurses can ensure that patients are more likely to engage in positive health behaviours; acquire greater knowledge about their health, and more skills and confidence in managing it; and be more satisfied with the care they receive. Share article: Coming out in cancer care: is disclosure of sexual orientation beneficial?